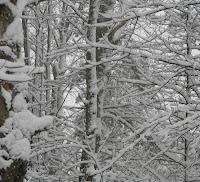 I'm wrapping up the year with some of my favorite or most popular posts from 2008. 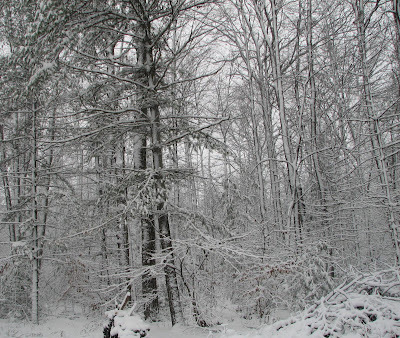 This one, first posted in July, looks pretty good to me right now in contrast to the blizzard raging outside. 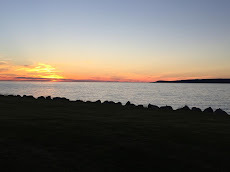 I spent the Fourth of July weekend in Sault Ste Marie, Michigan. Known as the Soo by locals, it's a port of entry with Sault Ste Marie, Ontario and home to the Sault Tribe of Chippewa Indians on both sides of the border. 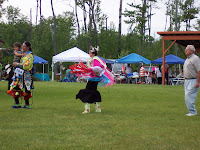 Site of one of the longest-running continuous powwows in North America, this year was the 27th annual. 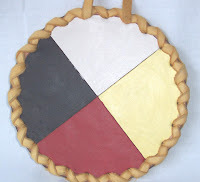 Powwows are laid out in a circle, like the medicine wheel. 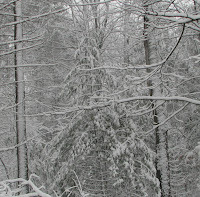 In the center is the arbor. This is where the drums gather to sing and beat out the rhythm of Earth's heartbeat for the dancers. 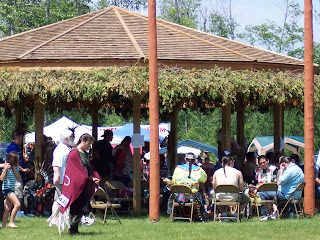 The dancers' circle moves around the drum arbor. 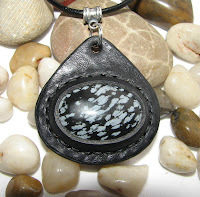 Like the medicine wheel, it begins in the east, where the gate for entry and exit is located. Movement within the circle proceeds, like the wheel, from east through south, to the west and then north before winding up back in the east where all begins. 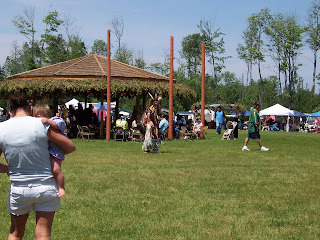 Around the outside of this blessed circle is the area where people gather to watch and the vendors set up their canopies and sell their wares. Symbolizing the unity of all as children of the same creator, as well as calling to mind the different stages of life as a human, the wheel is a powerful emblem in many traditions. To wrap up the year, I am going to repost some of my favorite or most popular articles from 2008. This post about making pouches was first published in July. Since I'm currently on a pouch-making frenzy, it seems appropriate. My supply of pouches has been crying for attention, and finally I gave it some. 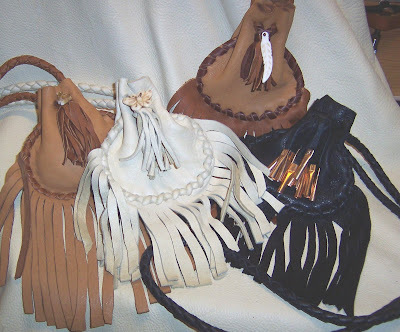 Deer hide pouches, sized for wearing around the neck or carrying, with fringe and cones or fetishes of bone. My methods are decidedly low-tech. 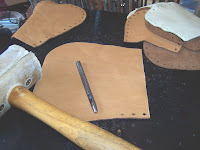 All pieces are scissor-cut by hand from my own patterns, holes are individually punched with drive punches and a mallet, and hand-cut deerhide laces are used to bind it all together. 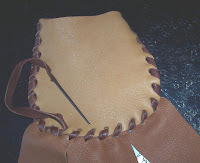 Fringe-pieces are inset, adding to the strength of the pouch bottom. The stitch I use is a lot less fancy than it looks -- it's a simple whip-stitch, but I whip it in both directions. In truth, I never cared for the whip-stitch as a binding on bags, though it's the way I was taught long ago in my hippy-leather days. It tends to pull everything in one direction, and it leaves gaps where stuff inside the pouch can protrude. Out of this frustration came the idea to reverse the whip-stitch at the end and run it back the other way in the hope that it would pull everything even and close those gaps. It worked so well I've been using it almost exclusively ever since. Looks handsome too, doesn't it? Fringe is cut with scissors after the pouch is stitched -- less tangling that way. 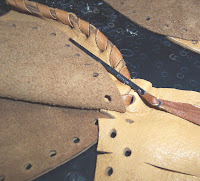 I use round braids for my straps, feeding them through round holes before binding them and adding a decorative touch of cones or a fetish. Most of these will wind up as medicine bags; carrying someone's tobacco or personal spiritual items. That's both an honor and a responsibility that I don't take lightly. Every one of my pouches is individually made in a good way. The fact I have so much fun doing it is a bonus for me! To wrap up the year, I am going to repost some of my favorite or most popular articles from 2008. This post, first published in October, received several lovely comments. 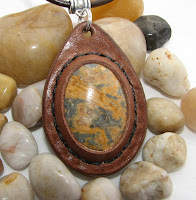 I really like wearing stones, and leather compliments the feel of the stone nicely. So I've created these. 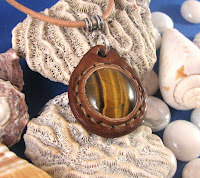 I call them Earth Medallions; an homage to the gifts of our planet. 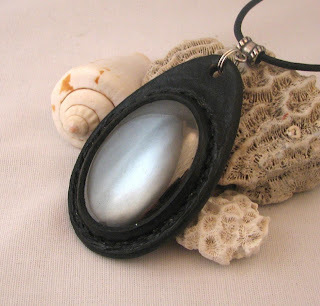 The leather setting frames the treasure inside perfectly without overpowering it, allowing the stone to remain the star. 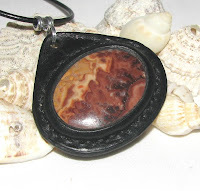 They've been very popular for me -- perhaps the first "it" item I've ever created. Frankly, I can understand why and I'm not sure I can grab much of the credit. 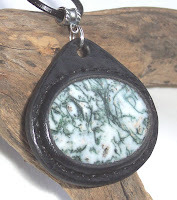 When you start with something as beautiful as a natural bit of rock, it's difficult to go wrong! 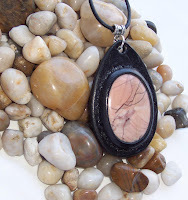 There are varieties of agate, bits of fossil, chunks of semi-precious gemstones... the appeal is universal. They have found homes around the necks of men and women throughout the world, thanks to the wonders of the Internet and the associated ease of selling internationally. The furthest-flung order I've filled was from Slovakia, which is real thrill for a small-town crafter! I'd love to show you all of my favorites, but the problem with that is that they are all my favorite!! Every time I get to the part of the process where I cut the window to reveal the beauty within, I get a thrill of satisfaction that is tough to quantify! Check back often, as I am always making more! My only regret? So many rocks, so little time! To wrap up the year, I am going to repost some of my favorite or most popular articles from 2008. 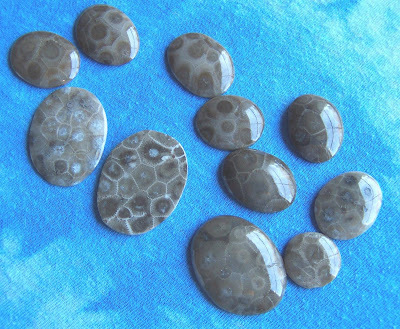 This info on the Petoskey Stone was first posted in March. To wrap up the year, I am going to repost some of my favorite or most popular articles from 2008. This one seemed to delight a number of readers when I first posted it in February. Enjoy! To wrap up the year, I am going to repost some of my favorite or most popular articles from 2008. This was my opening post from back in February. Enjoy! 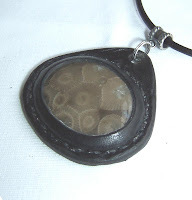 One of the questions I hear most often about carved leather items is, "How long did it take to make that?" First is drawing and cutting. 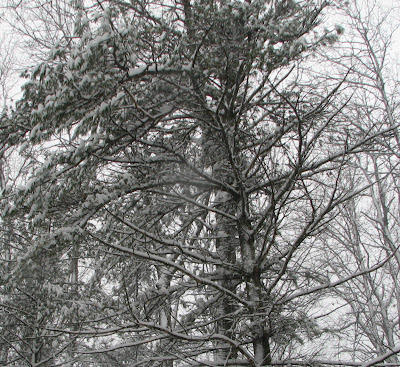 My family has many Holiday traditions, some new and some that go back through generations. 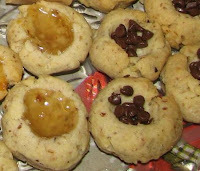 One of our favorite and longest-standing is the annual yum of Thumbprint Cookies. I remember helping my mother make them when i was very small, and my children grew up helping me. When my oldest daughter spent the Holiday season in Italy during college, her one request from home was for a tin of these favored treats. My youngest daughter agrees -- it's just not Christmas if there aren't any Thumbprints! 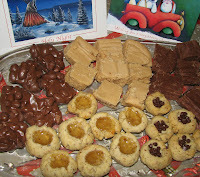 This is an unusual cookie recipe -- It contains equal amounts of ground nuts and flour, giving them a wonderful texture. 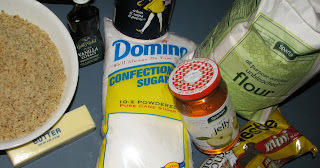 There isn't much sugar to the recipe, and no eggs or leavening products. Trust me; none of this is a typo! They bake on low heat and will come out of the oven looking very much like they did when they went in. But my oh my! 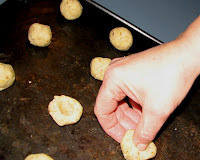 Very rich, nutty and flaky; they are sure to become a favorite with anyone who tries them! So Merry Christmas -- my gift to you is this wonderful family recipe... enjoy! after these are well blended, add vanilla and stir just long enough to mix it in. Add dry ingredients, 1/2 at a time, mixing well between halves. 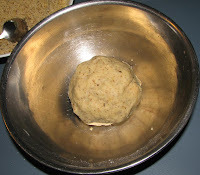 Add nuts and continue working the batter until you have a firm ball and a clean bowl. Cover and chill in the refrigerator for about 2 hours. Spoon off teaspoon-sized chunks from the batter ball and roll into small balls, about the size of a large marble. Place on ungreased cookie sheet about 2" apart. Cool for several minutes before removing from cookie sheet with a spatula. Cool completely before eating. This is a cookie that benefits from being made ahead of time, as they are even better after sitting in a tin or covered container overnight! Change is... Scary? Inevitable? Exhilarating? Yes, all of the above and more. After many changes through the years of doing what I do, I find myself staring at another. 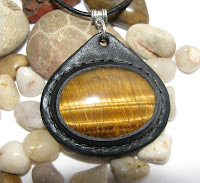 If you've been following my blog, you know that my stone & leather pendants, called Earth Medallions, have been more popular than I could have anticipated. So very popular, in fact, that I am now faced with the difficult reality that I may need to abandon most of the rest of what I make just to keep up with the demand. A mixed blessing, to be sure. 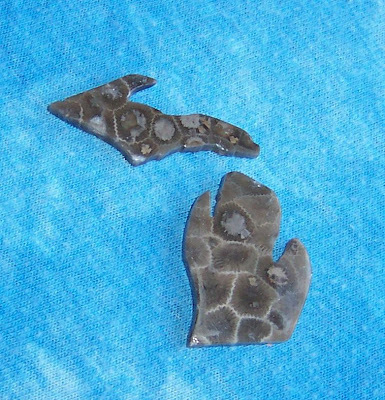 While it's certainly wonderful to have found such an "it" item, it may necessitate a long period of time not tooling leather belts, not making regalia pieces, not going to powwows. 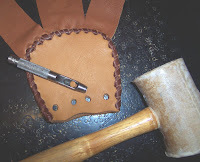 I have already quit making my deerhide bags for now-- they are very labor intensive and I've always had a hard time getting paid sufficiently for the work and materials involved. 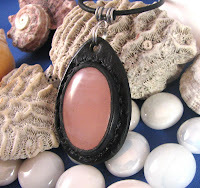 Of course, change need not be permanent, and it's likely that the fervor for my pendants will fade after a time. So though I may change course for awhile, I will also look to the day when I can change back. For now I am still making wristbands -- they allow me to keep tooling (which I love!) and to use up some of my belt leather while not taking too much time away from my EM's. I also will still fill belt orders and will consider regalia requests on a per-item basis. Change is inevitable, I've decided, and exhilarating. And a bit scary. I still have some belts left in stock -- they'll be available until they're gone. I still have guitar straps -- a holiday tradition with me, and I have a nice selection of Earth Medallions including (at posting time) all of the lovelies pictured here. So Happy Holidays to all. Happy changes as well!! 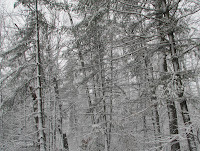 Color pictures of my black & white world; further words unnecessary!